Puddings are my favourite. I always make at least a type of pudding in very weekend when everyone is at home. My sister was a big fan of puddings. And many times it was her decision to make the puddings which flavours she liked. I always wanted to try the puddings of pistachios. But it was not easy because at that time pistachios were not that much easily accessible for me. So I left the idea of Pistachio pudding. This is a Pistachio pudding adapted from one of my friend and relative. She is a cook and always curious about desserts. This is her type of recipe she tried at her home many time and got applauded many times. Actually I have had this Pistachio pudding once I visit her home. She always has any one of the pudding in her fridge. This is not just a pista pudding but it has all the good parts of pista jellies and the flavours of other ingredients and goodness of apples. What kind of pudding included raw fruits? Is that what you thinking. Then you have to try it at least once and I am pretty sure that you cannot stop making it. It is completely a flavour blast in a pudding form. I hope you foodies won’t miss the chance to get applaud. 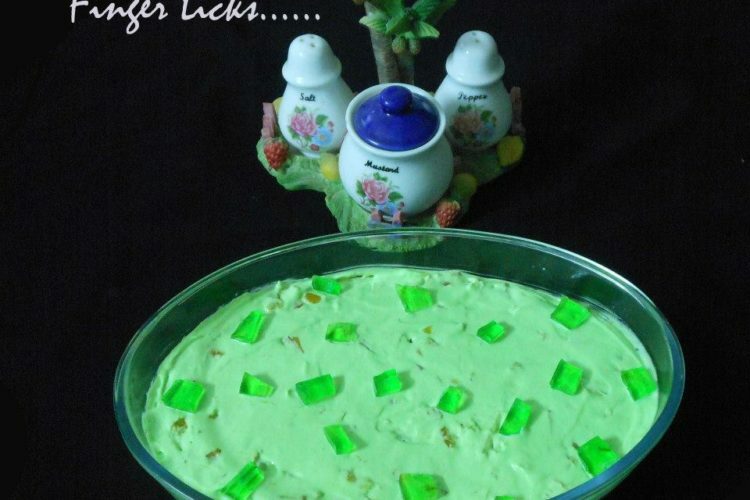 So do try this Pistachio Pudding and enjoy! Soak the china grass and melt it. Mix Corn flour and little milk, pour this to remaining milk and boil it. Add melted china grass to it and switch off the flame. To this add condensed milk and required sugar, mix well. Pour this to a pudding dish , When it cools transfer to refrigerator for setting. Mix whipping cream with pista essence, small pieces of green jelly, chopped pista and mixed fruits . Pour this over first layer, Garnish with jelly pieces and again place it in refrigerator for setting.